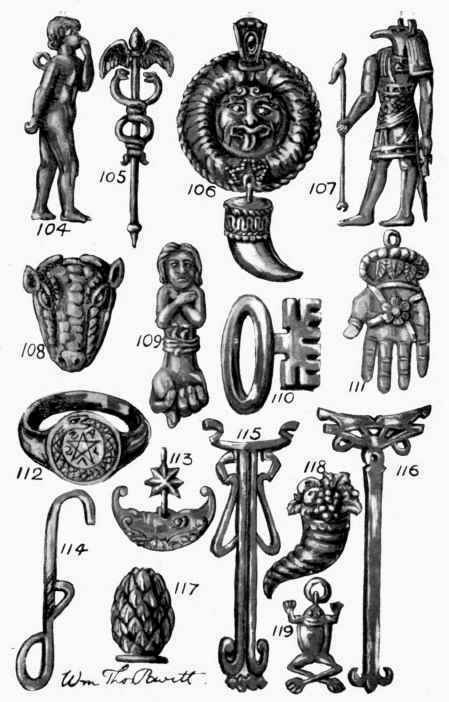 The Etruscans, Greeks And Romans were all familiar with and great believers in the virtues of Talismans and Amulets, a belief based not only on the symbols of their own faith but largely influenced by the beliefs of the surrounding nations, that of the Egyptians being particularly noticeable. Amongst the earliest and most popular Talismans are many Scarab rings with inscriptions cut in the under sides; these were frequently used as seals. In the course of the amalgamation of beliefs which took place under the Ptolemies, Isis and Osiris were associated with all kinds of Asiatic and Greek gods; but, as time went on, Isis became the most universal goddess, ruling heaven and earth and all Mankind, her worship quickly spreading throughout all the Roman dominions. Her name is usually understood to mean Wisdom, and upon the pavement of her temple was inscribed, "I am everything that has been, and is, and shall be, nor hath any mortal opened my veil". "Crowds of boys Worry me with eternal noise. Straws laid across my path retards, The Horse shoes nailed each threshold guards. The stunted broom the Wenches hide In fear that I should up and ride".